Buenos días! Esta semana se acaba (oficialmente) el invierno y llega la primavera!!! Si, todos estamos deseando que llegue el buen tiempo, pero yo de momento no me quito el abrigo y hoy, para despedir a la estación fría, quiero dedicarle el post a la prenda de la temporada, esa que ha hecho mas llevadero el invierno de este país: La Bufamanta! (Más vale tarde que nunca...) Si, vale, es como una epidemia, como si fuesemos de uniforme, pero no me digáis que no es adorable, tan suave, tan calentita... yo ya me veo haciendo picnics sobre ella en cuanto lleguen los días de solecito! Tenéis una? Dos? Media docena? O no os gusta nada? Aparece en vuestras pesadillas??? Good morning! This week Winter is gonna be (officially) over, and Spring is coming!!! 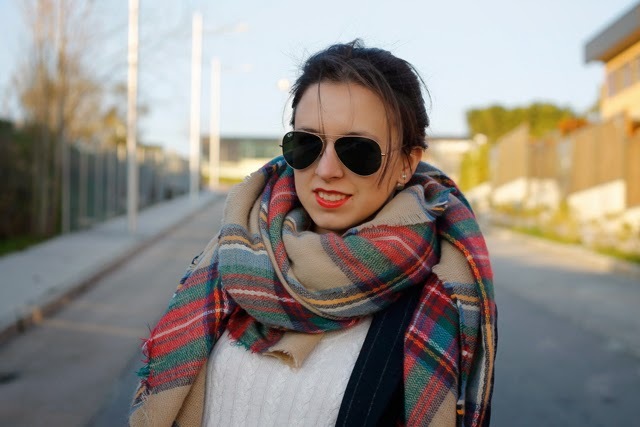 Yes, we're all looking forward to good weather, but I'm still wearing coats and today, to say goodbye to the cold season, this post is a tribute to the must of the season in Spain: The Scarf-Blanket! Yeah, I know maybe it's been too much, like it was part of our "national winter uniform", but don't tell me it isn't adorable, so soft, so warm... I think I'm also gonna use it in Spring as a picnic blanket! Do you have a maxi-scarf? Two? Half a dozen? Or you don't like it at all? Is it part of your worst nightmare??? 45 No te olvides de comentar! / Leave a comment! it looks very nice! I adore big scarves! the bigger the better! great outfit,, I love that coat! Great scarf! i was also a bit sad to put away gorgeous blanket scarf, but when you think about all the options spring brings it's a bit easier! 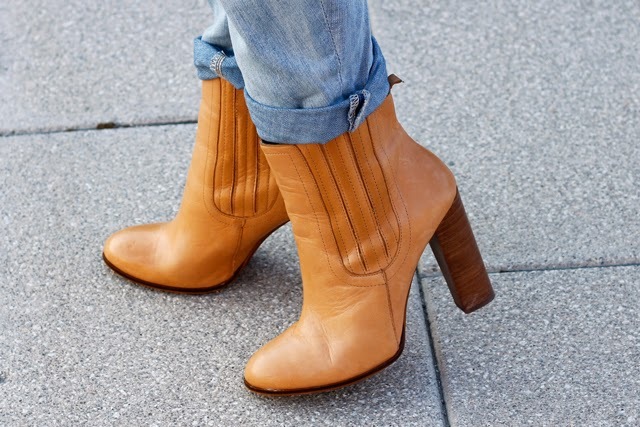 Me encantan los botines y el bolso! Precioso el look! el bolos me encanta! You look fantastic, love the plaid scarf. Have a great week doll! ¡qué bonito es tu abrigo! Yo no termino de verlo claro, jajaja, siempre paso la semana santa en el pueblito bueno y con abrigo!!!! tenemos que vernos!!! i know bidding winter goodbye and summer a warm welcome ...wow i cant wait...btw u look awesome!!! Loving your outfit, great mix with the scarf & boots! I so love this post dear. Have a great day! O X A N A M.U.A makeup blog NEW POST! >> ORANGE LIP TREND! Fantástica!!! Qué maravilla de look. Una combinación preciosa. Your scarf is gorgeous and i love your boots. Fantastic look. I love the pinstripe coat! I've been looking for a similar one in India but they never ended up here :( Anyways you look absolutely fantastic and this is a perfect outfit! Amazing!!!!!!outfit....! great scarf,, you combine perfect your coat... you look so pretty.. Thanks for your comment dear! Awesome look! Booties and coat are great! Bye bye winter!!! yeeeesssss!!! We love the spring! beautiful scarf! siiii menos mal que primavera llega ya ;) que bonito el look! sobre todo la bufanda y el abrigo!